A loan of $175 helped to pay the rent and buy materials for her laundry shop. Kumkum is a 40-year-old hardworking woman who lives with her husband and their one son in a small village of Kandi, West Bengal. Kumkum is a mother of a son; her son reads in grade 5. Her husband works in a paper shop. 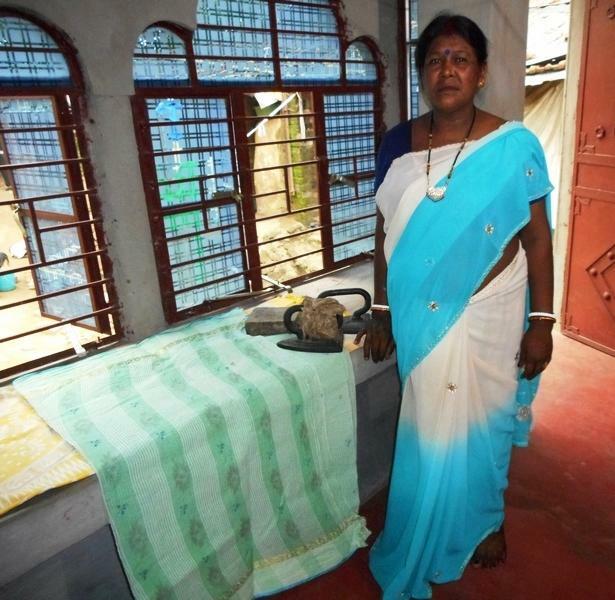 Kumkum runs a laundry from her home. Kumkum washes and presses garments. Her neighbors are the main customers, and she is well known in her community for her good services. Now she wants to rent a shop in the market to serve more customers, but she does not have sufficient money for that. Thus, Kumkum is seeking a microfinance loan from BJS (Kiva’s partner) to pay the rent and buy detergents, a new iron machine, etc. for her laundry business. She hopes there will be a larger increase in profit through the utilization of this loan. Kumkum is very thankful to the lenders for their financial assistance. This loan targets women in the financially underserved parts of India. With a largely rural population, the Jalpaiguri, Alipurduar, and Cooch Behar districts in the state of West Bengal are severely lacking in infrastructure and are three of the poorest districts in Eastern India. This loan enables female entrepreneurs to maintain their current businesses in an area that is under-developed and poorly served by financial institutions. Belghoria Janakalyan Samity (BJS) is a non-profit organization located in India that focuses on poverty alleviation through women’s empowerment. The organization is remarkable in its commitment to the holistic development of some of the poorest districts of West Bengal and goes further than most of its competitors in offering vital access to social services like child schooling, medical services and financial literacy training in addition to credit. Kiva lenders’ funds will be used to create new loans for clients, expand the reach of the organization into more rural areas, and deepen the scope of BJS’s non-financial services that provide key support to the surrounding communities. BJS goes further than most microfinance institutions in its commitment to holistic development within the communities that it serves. Kiva is proud to offer our lender community the opportunity to support an organization that seeks to financially empower vulnerable women while also providing their communities with vital access to health services and children’s education.